Changes log and improvements made over time indicating the software version in which it occurred. Highlight for POS – Touch a Sale with all the functionality for Touch or Mouse, tablet, etc. The simplified invoice (FS) does not allow by law total more than 100 euros (or 1000 for Retail). If your CAE supports Retail (Confirm please with your accountant), you may use the FS for transactions up to 1000 euros VAT incl. However, only the Simplified Invoice is subject to these limits. 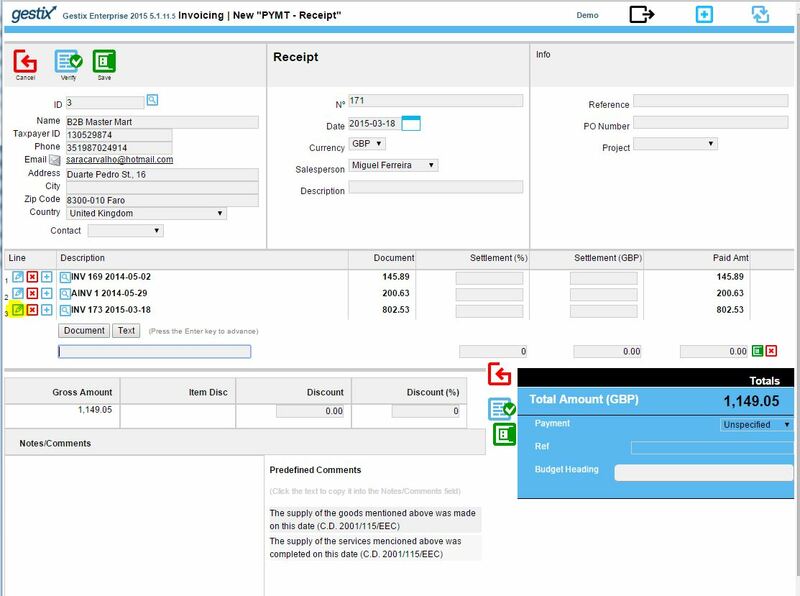 You can use the Invoice / Receipt type that is an equivalent cash-sales bill yet with no amount limit. 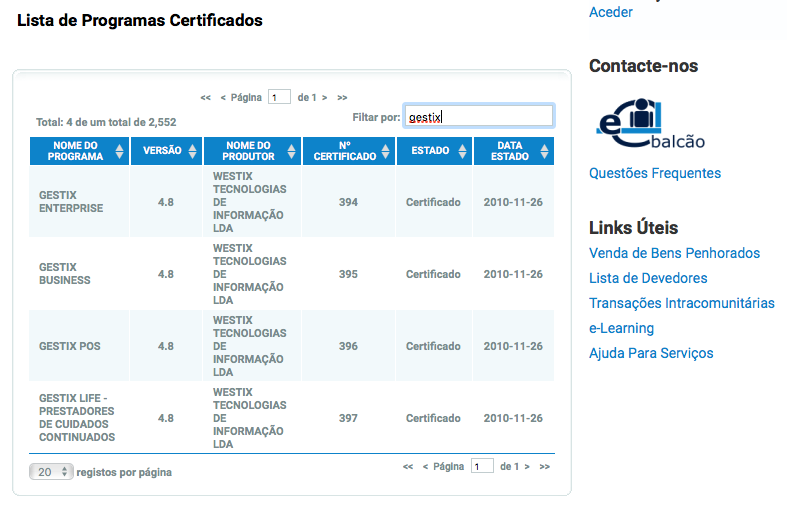 Note that this series requires the specification of VAT ID number as per the Portuguese VAT directives. For further information please contact the Gestix technical support service. Portuguese Tax Authority published Ordinance no. 302/2016, dated December 2. It changes the data structure of the file referred to in Administrative Rule 321-A / 2007, dated March 26, and creates the taxonomies to be used in filling the SAF-T file (PT) – see original document. Associated Legislation: Administrative Rule 321-A / 2007 – 26/03. The said decree shall enter into force on January 1, 2017 for the years 2017 and following, except for the data structure referred to in Article 3, which shall come into effect on July 1, 2017. Gestix is ​​available in Gestix Cloud editions (1) and Gestix Download editions, installed on the user’s own server (2). The update is automatic and transparent for the User, there is no need to take any action for now. 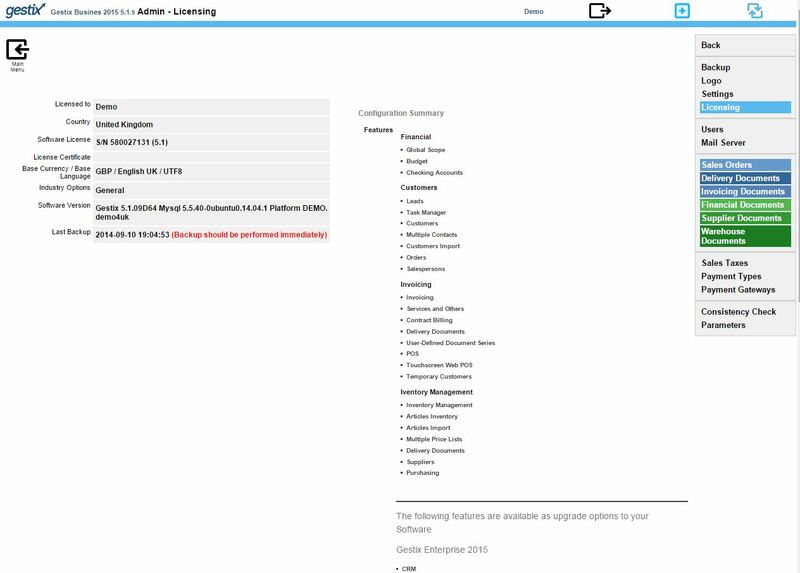 New taxonomies are automatically assumed for documents issued as of July 1, 2017. Installation on the server itself is maintained at the user’s own risk. 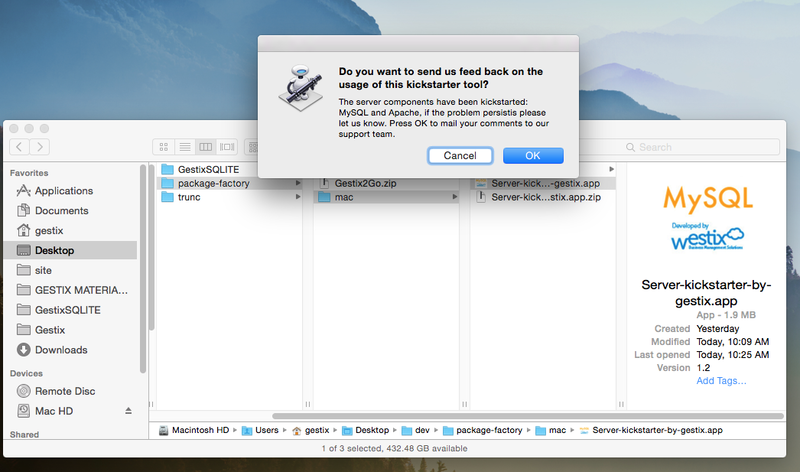 In this case you need to install an update of the Gestix software. Ensure that you are up to date with the latest Gestix 5.2.03, to apply the new taxonomic rules: despite the submission of the SAF-T 1.04_01 file, for documents issued as of July 1, 2017, only be accepted by e- Invoice as of August 1, 2017. A new update, Gestix 5.2 is being released. This update introduces the table of standard VAT exemption reasons, as recommended by the Tax Authority. It also includes several enhancements and fixes relative to version 5.1. If you use Gestix Cloud, the update is automatic. It appears information to the user that it had an effect, and no need to do anything else. The new Table Normalized VAT Exceptions can be accessed in the Admin / VAT rates menu. When invoicing with VAT exemption will now be available the codes in this list. 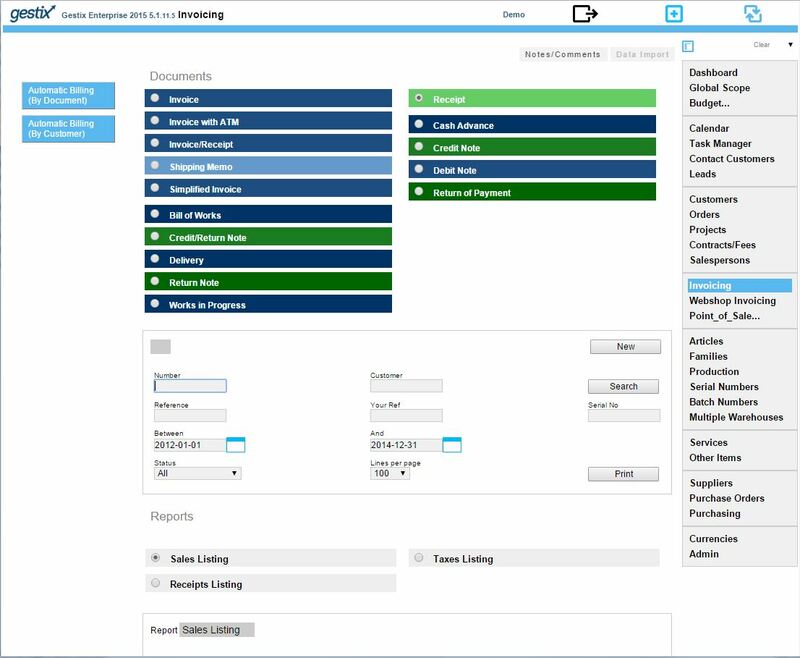 You find in this menu the ability to edit the list to remove the options possibly not necessary in the case of your company. In countries where it is not compulsory to use certified billing software, the new version does not require changes to the VAT table. 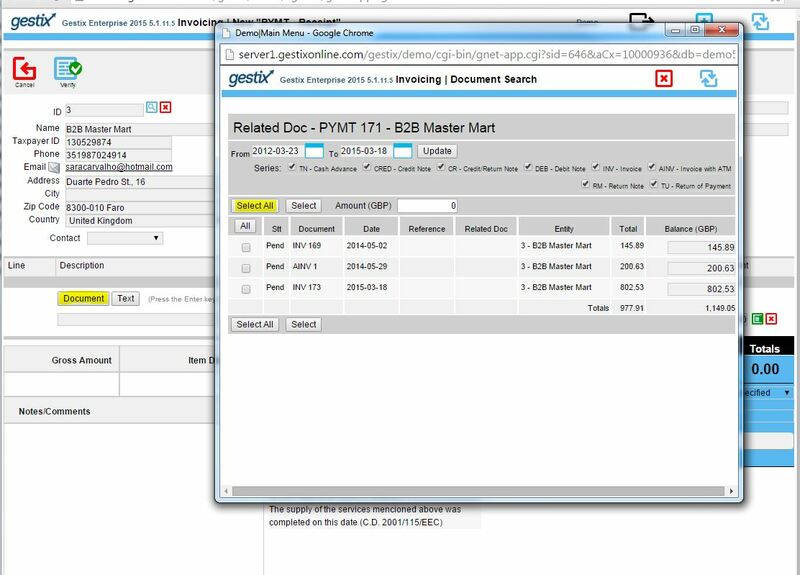 However, it offers a new security option to give more freedom to editing invoices and other documents after recorded, as in earlier versions of Gestix prior to the 2008-2010 certification. 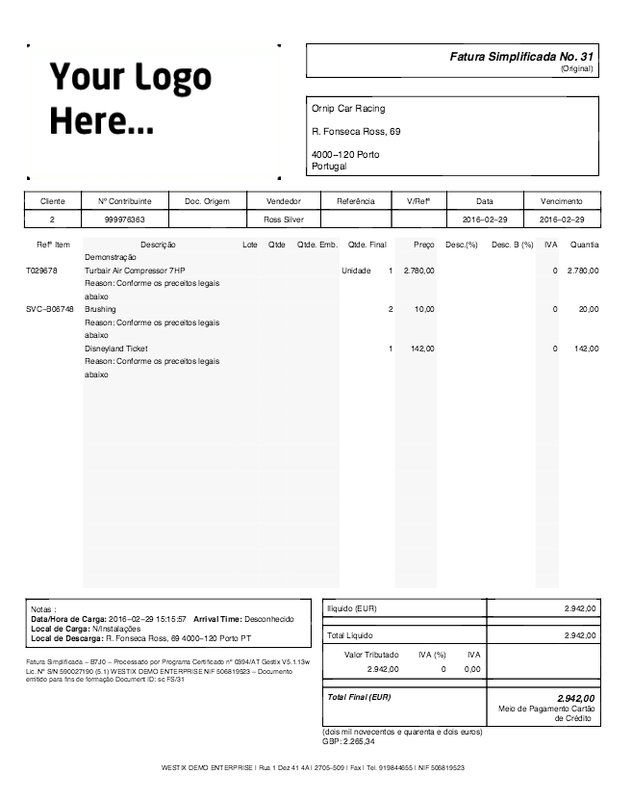 In this example, our billing is in EUR (Euros) but want to display the amount in GBP (Great Britain Pounds) in the invoice to certain customers. 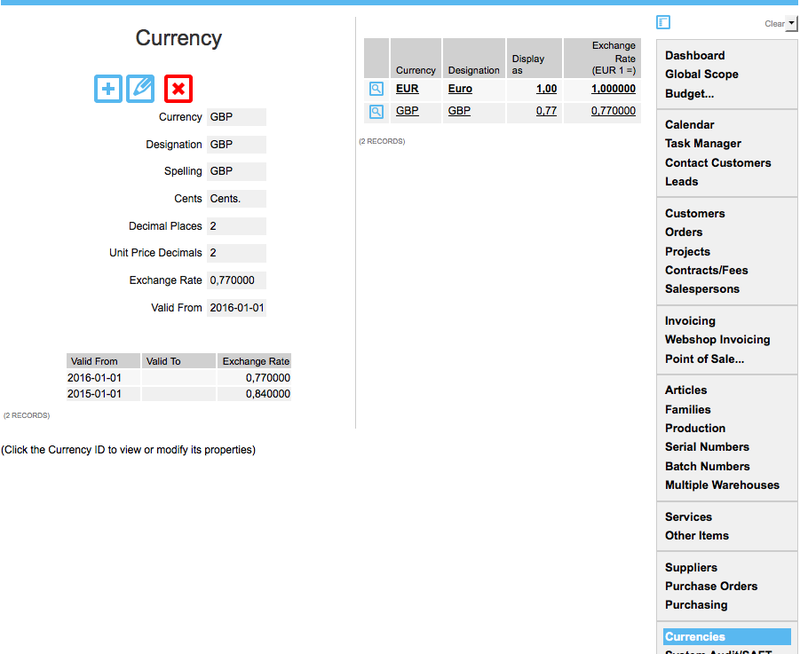 First, add the GBP currency onto the database and specify the exchange rates (Currencies menu). 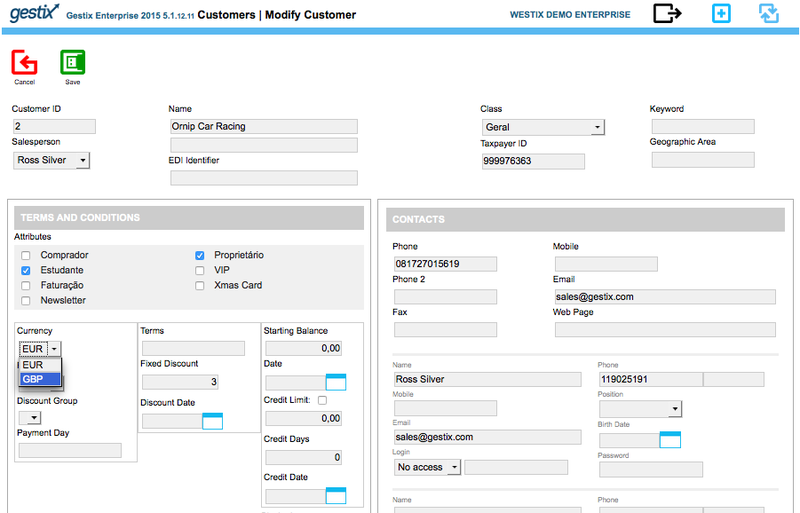 Then, in the Customers menu, edit those customers that want the amount in GBP shown on their invoices. 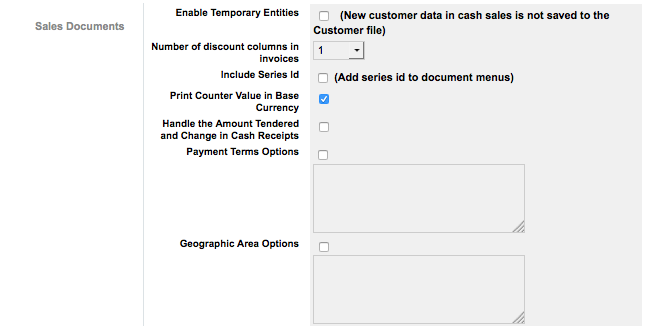 Finally, check the Admin | Settings menu to ensure that the Display Counter Value in Base Currency option is enabled. When Display Counter Value in Base Currency is enabled, if the customer’s preferred currency is GBP and the invoice is in EUR (the base currency), the amount in GBP will be printed in the invoice. If the invoice is in GBP, the amount in EUR will be printed instead. Any questions or comments? please submit them below. 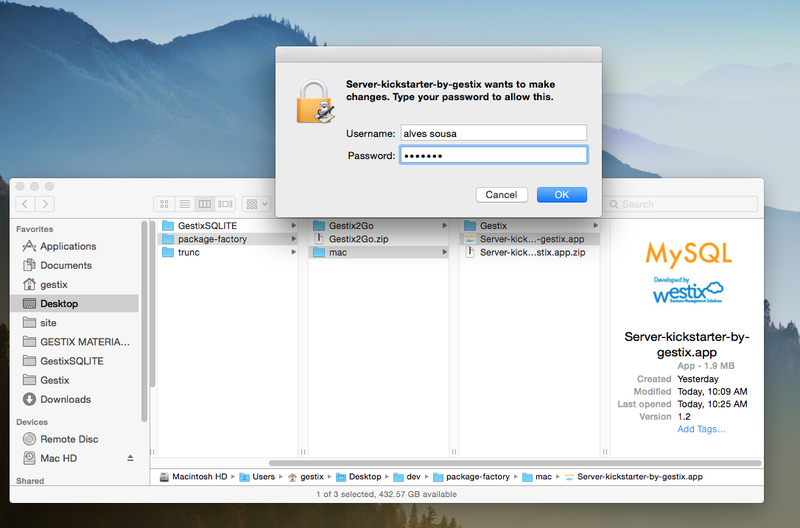 The script will try to launch MySQL by calling mysqld_safe directly, thus without the need to have the StartupItems / System Preferences components installed. Then it will try restarting apache as well, by invoking apachectl restart. Open the application, it will prompt for the computer’s password. 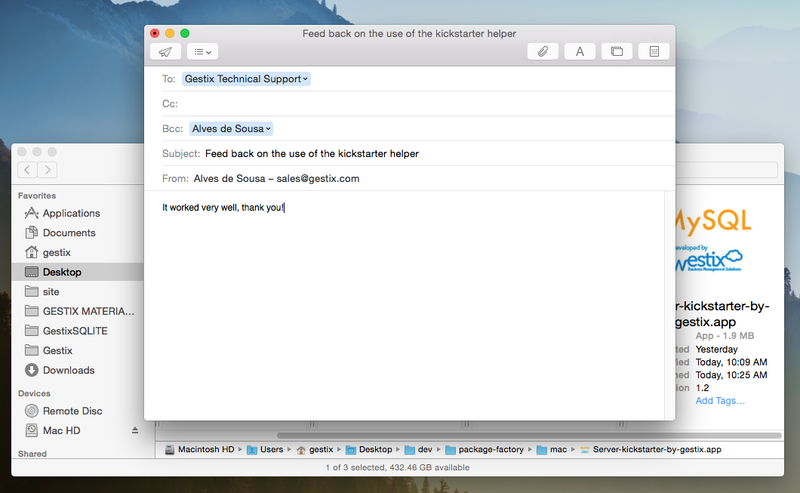 Then it tries launching both services and displays a confirmation message that enables sending your feedback directly to the supporting team. 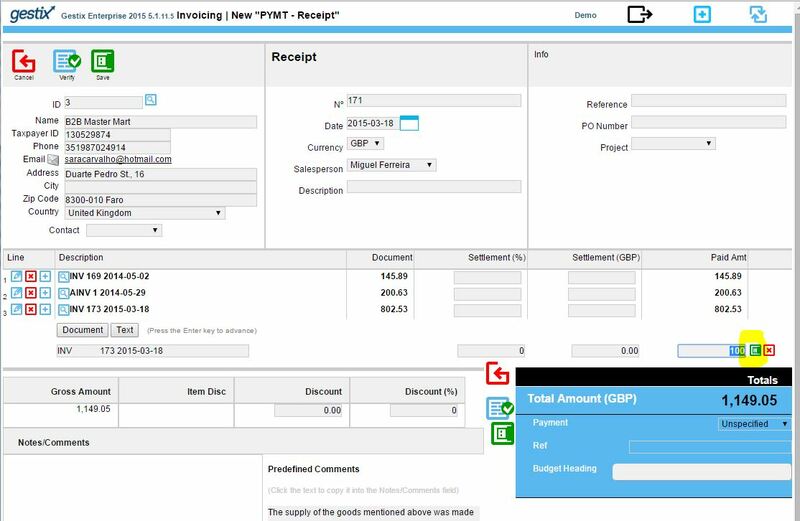 With the Gestix ERP you can easilly issue a payment receipt for part of an invoice. Here we go through the steps to process a customer payment, from the Invoicing menu, whereas a similar procedure would be performed for processing payments made to suppliers from the Purchasing menu. 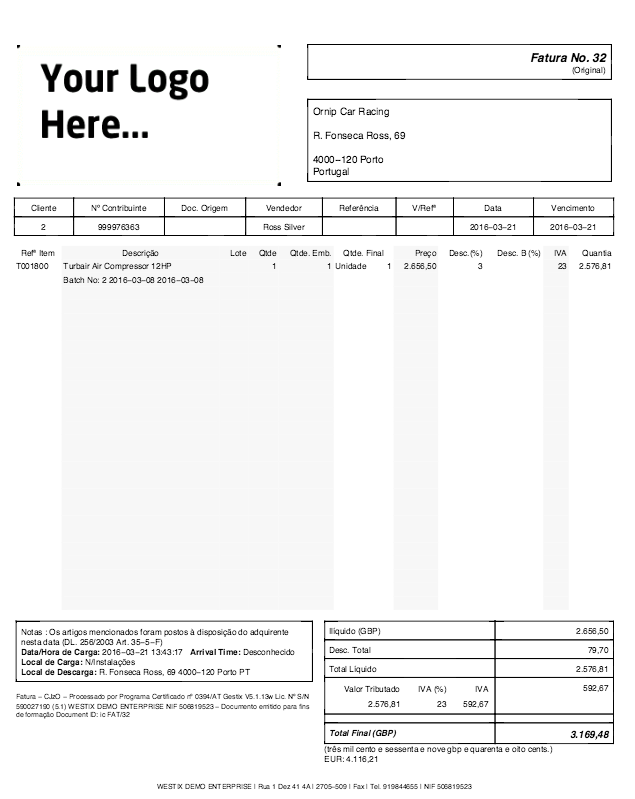 Open the Invoicing menu and click Receipt, New. 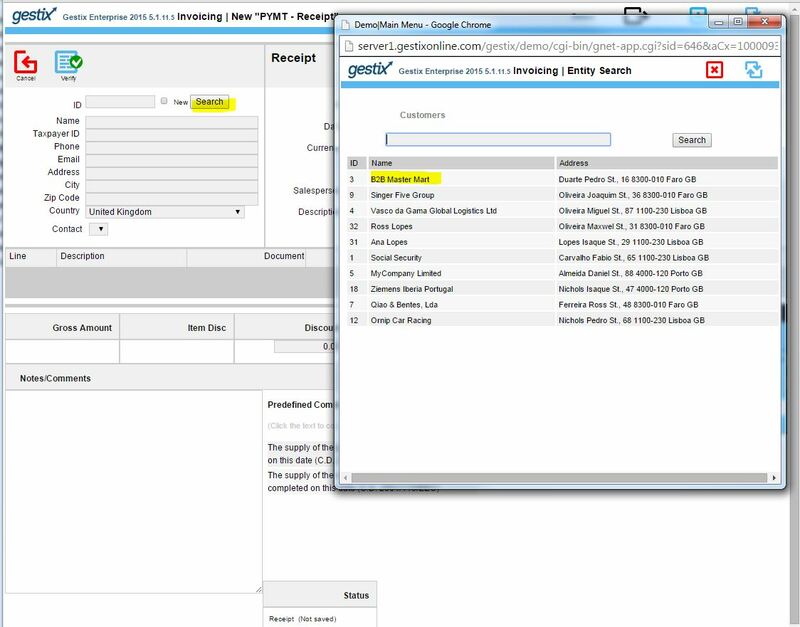 Here we’re clicking the Search button to choose the customer from a pop-up list. 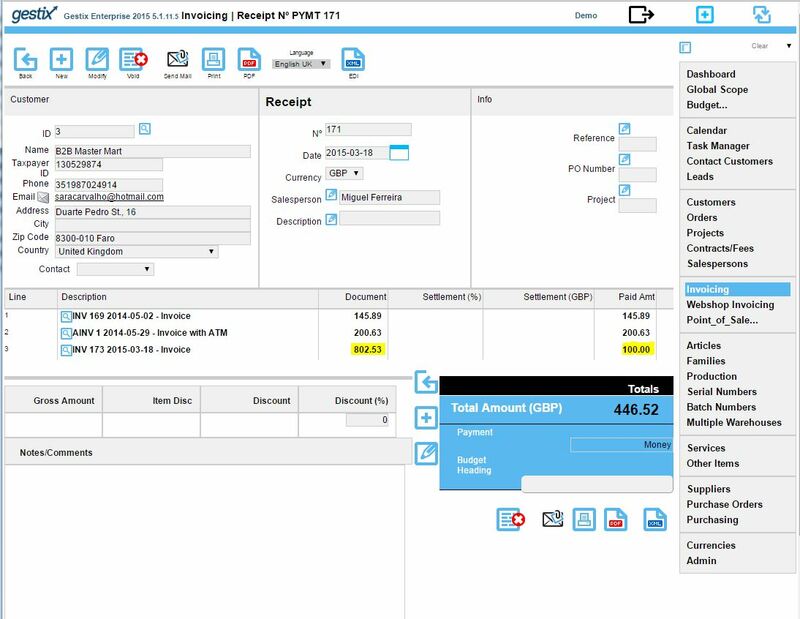 Then we click the button labeled Document to select the invoices being paid, then we click over Select All to add those invoices to the receipt. 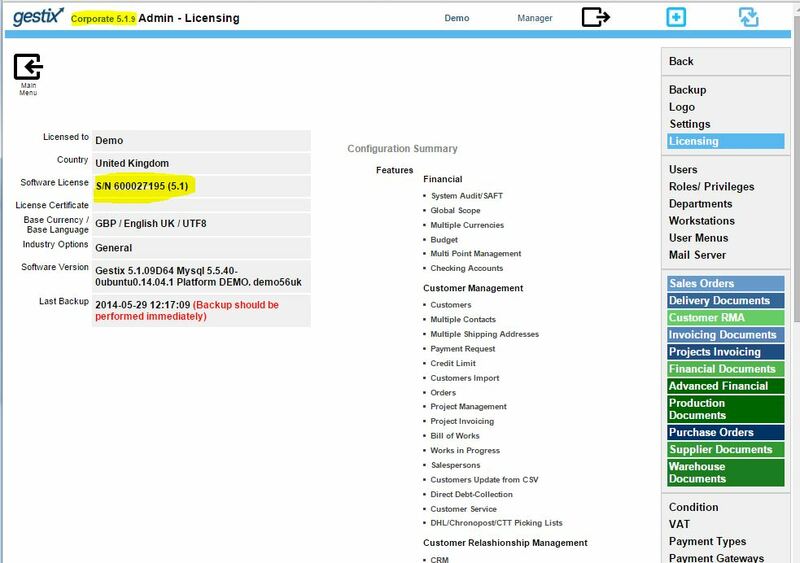 Since the customer is paying the amount of GBP 446,52 and the selected invoices total is greater than this, we want to edit the amount paid for, say, the last of the three invoices. Click the little pencil button labeled Edit at the left hand side of the line. Now let’s enter the correct amount and click the little button labeled Save next to the Paid Amt field. Click the Save button at the top of the document, and it’s ready to print or send by email. 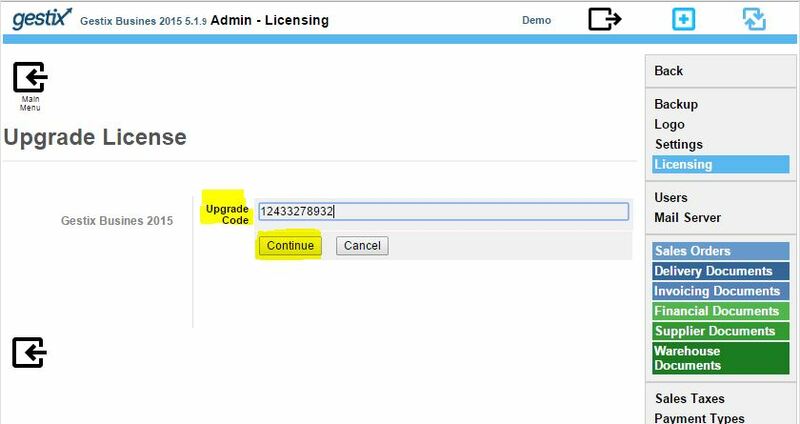 To add features to your Gestix ERP you can buy the Gestix product/edition that best suits your needs and upgrade your old license. 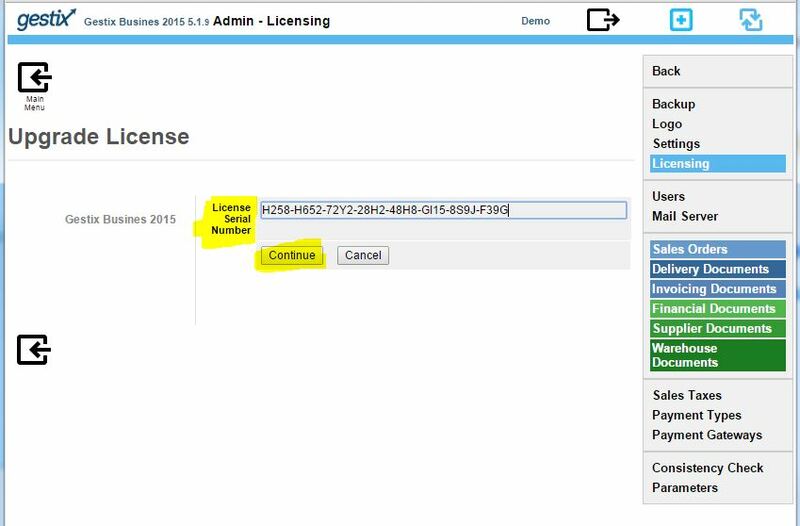 Open the Admin | Licensing menu and click the Upgrade button that is shown below the list of features. Enter the Upgrade Code included in the delivery instructions that are sent by email along with the invoice PDF. Then enter the License Serial Number. Click Continue to complete the upgrading process. Gestix will then show the list of features of the new edition. Press Back to return to the main menu and check all the new features.